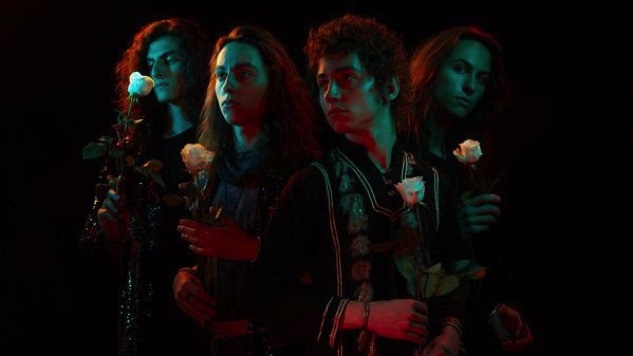 Greta Van Fleet was formed in Frankenmuth, Mich.—a quaint Bavarian-inspired town best known for it’s year-round “CHRISTmas Wonderland”—in 2012, at a time when each of its four members (Josh Kiszka, Jake Kiszka, Sam Kiszka and Danny Wagner) were teenagers in high school. Despite releasing a handful of tracks, many of which are no longer available, the band’s professional career as musicians didn’t truly take off until five years later when they signed with Lava Records in 2017. When it took off, however, it did so like a rocket. While the band’s success may seem to have come out of nowhere, its four members are working hard to attain it. Still, when you ask a group of classic-rock super fans—the demographic one might expect to be wholeheartedly in support of Greta—you’re likely to get a mixed bag of responses in return, ranging from “a complete revival” to “entirely too derivative” all the way to a scathing 1.6 review on Pitchfork. Usually, these responses hinge on the comparisons to Led Zeppelin that have followed the band, something that was stems in part from lead singer Josh’s Plant-ian howl that’s certainly channeling something. While the obvious similarities brings criticism, the band has handled it all in stride. In part, this could be because it also brings in a wide age demographic and, from that, a special kind of fan relationship—one between parent, having aged with the genre, and child, first exploring rock ’n’ roll. Unlike the bands of the ’70s and the debauchery-filled decade against which they are compared, however, Greta is certainly more radio-friendly for younger viewers overall, both on stage and off. They’ve got the sound, sure, but the scandal? For four young guys ranging in age from 19 to 22, they instead have a shocking lack of scandal. As the band’s popularity has grown, they’ve naturally ventured farther and farther into the music machine. Their debut album, Anthem of the Peaceful Army, released on Oct. 19, was recorded in Nashville’s Blackbird Studio rather than Michigan. Though the band brought its crew down south for recording—again produced by Marlon Young, Al Sutton and Herschel Boone a.k.a. The Rust Brothers—the relocation was done with intention. Keeping the same classic rock/blues/soul roots from the earlier EPs, the album reaches for broader, earnest sentiment beyond the day-to-day lives of the four creating it. With its release, the band invited fans to respond to their “call to arms” to “sing along to the Anthem of The Peaceful Army,” envisioning the music as a uniting force. In addition to songs of love and love lost, many of the tracks are calls to saving the planet and uniting people of all backgrounds under one peaceful cause and the umbrella of rock ’n’ roll. Again, the earnest platitudes can divide fans and critics, believers and cynics. Following the album release comes the band’s biggest venture yet, 2019’s March of the Peaceful Army world tour that will send the young musicians all over the world for the first six months of the year, including their first visits to Australia and New Zealand. As the band grows busier and reaches larger audiences, worry over staying grounded would be natural. However, the band has no such fear—they’re confident the path they’re following is right. With that in mind, the members of Greta keep focused on bringing rock ’n’ roll to fans and not worrying about charges of imitation.